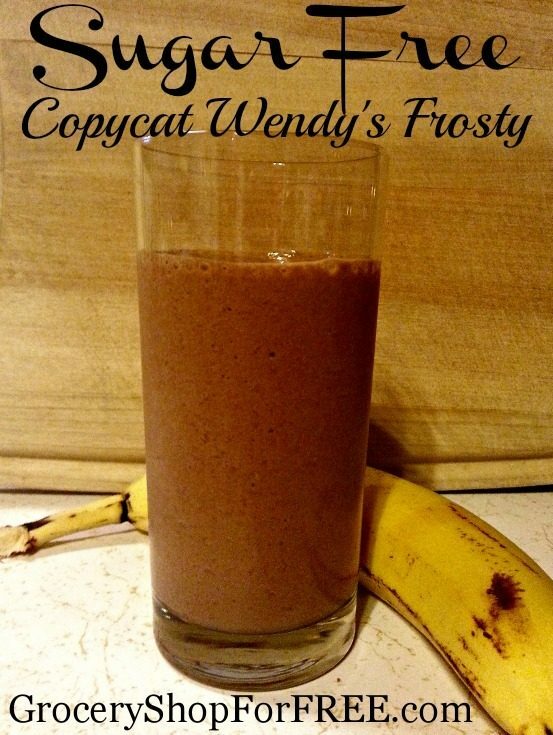 Sugar Free Copycat Wendy's Frosty! You are here: Home / Recipes / Dessert / Sugar Free Copycat Wendy’s Frosty! I absolutely love stopping by Wendy’s and grabbing a Frosty but the calories in it are not on my list of “okay” food items. This Sugar Free Copycat Wendy’s Frosty uses a few ingredients I wouldn’t have expected would work but in the end it creates just the right chocolate flavor with the cold and creamy texture we are so used to seeing in a frosty. The best part? This recipe with 2 servings comes in well under 150 calories per serving. Just the right extra treat at the end of the day or a special afternoon pick me up! Place crushed ice, milk and vanilla in blender and puree until frothy. Add in banana and pulse until smooth. This yummy treat is so quick and easy to make. The PB2 helps hide the banana flavor and enhances the chocolate. If you don’t mind a little bit more banana flavor you can easily leave that ingredient out and still have a wonderful cool and creamy chocolate treat. The Sugar Free Copycat Wendy’s Frosty will surely be a hit with everyone in your family and will soon become a classic treat you will serve alongside your favorite turkey burgers and baked home fries. **PB2 is a great peanut butter substitute found in powdered form at most grocery stores in the peanut butter or gluten free/organic area. This can be mixed with water easily to form a traditional peanut butter texture or mixed into things like this treat or brownies in a powder form for added flavor. Averaging from $4-$5 per bottle it is often found at the best price in bulk on Amazon. At only 35 calories per serving it will fast become a staple in the low fat kitchen.